Confessions of the Playground Princess: An 18th b-day calls for a Southwestern Fiesta! An 18th b-day calls for a Southwestern Fiesta! Well considering Mister Winter spoiled my daughters 18th birthday not only once but twice with the largest blizzards that the Washington Metropolitan Area has seen since the early 1900’s… I was determined to have a celebration with her and whoever could get over to our home to help celebrate. As usual I made enough food for an army! But the most popular items were the Mexican Lasagna and the Key Lime Tartlet’s so I’m going to share them with you! *I didn’t make this as a pie but rather individual servings by using premade tart shells that I got from the food store. *Emril uses a sour cream/powder sugar topping and I chose to make homemade whip cream which my daughter loves. *To make the shell which I didn’t-In a bowl, mix the graham cracker crumbs, sugar, and butter with your hands. Press the mixture firmly into a 9-inch pie pan, and bake until brown, about 20 minutes. Remove from the oven and allow to cool to room temperature before filling. In a separate bowl, combine the condensed milk, lime juice, and eggs. Whisk until well blended and place the filling in the tartlet shell. Bake in the oven for 15 minutes and allow to chill in the refrigerator for at least 2 hours. While that is chilling in the refrigerator take the heavy cream and beat it for about 5 minutes add the sugar and vanilla while beating. 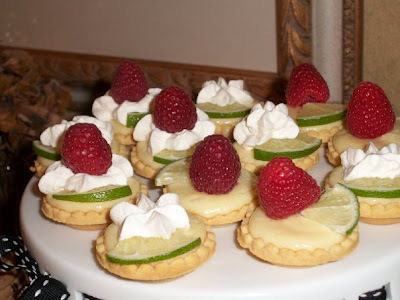 Spoon a small dab onto each tartlet and garnish with a ¼ slice of lime and a raspberry. These are so tasty you can just pop them in your mouth! Yum!! Let me know if you try either of these! Mmm...that's my kinda party! Love mexican food. Coming over from MBC, and following you here with both of mine. Love your blog! Do you know the "kitchen dance?"